This just in from mobile analytics company Flurry: Nexus One sales are still flopping. After 74 days on the market, Flurry estimates that Google has sold 135,000 Nexus Ones. 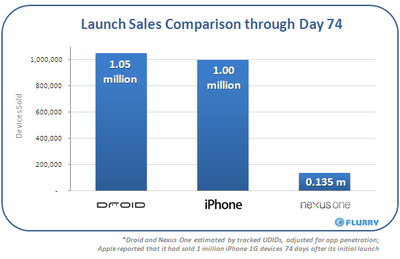 In its first 74 days on the market, the Droid sold 1.05 million units. In the iPhone’s first 74 days on the market, it sold 1 million units. For further context, the iPad just went on sale in an online-only mode and sold an estimated 152,000 units in three days. None of these comparisons can be “apples to apples.” The Nexus One is only available online, and only through T-Mobile. The original iPhone was a completely new style phone and it cost $600 when it came out. The Droid is on Verizon, sold for $200 during the holidays and marketed like crazy. The iPad is a totally new and unique product. Even with all those caveats, it’s evident that Google’s plan to disrupt the carriers by selling direct to the consumer is off to a very rocky start. See Also: NEWSFLASH: Google Is On A Serious Shopping Spree!